The Lohner Sissy from 1957 was a classic post-war two-wheeler, an affordable, easy-to-use 50 cc moped. The “Sissy” owes its name to the films of the same name starring Romy Schneider. 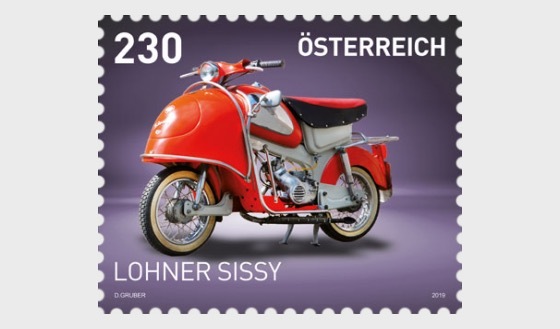 The Sissy was the first Austrian moped to be designed from the start to carry two people. It used a completely new method of construction: standardised components could be combined on a building block principle to produce different variants. A running board splash apron, a luggage tank, a plastic nose panel and a tandem crankset quickly became a two-seater scooter with storage space. A Sachs Type 50 three-speed integrated engine, manufactured by Rotax, enabled speeds of up to 40 km/h. The Sissy quickly became a hit, especially among young people, as it could be ridden without a driving licence and your girlfriend could ride pillion behind you. Women too were a successfully courted target group for the moped. By 1960 more than 35,000 mopeds from the Sissy range had been sold. 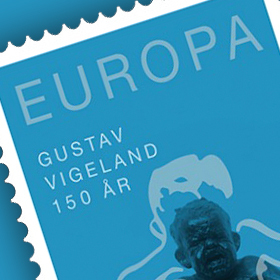 The 1957 model shown on the stamp is the deluxe model with a nose panel incorporating a luggagecompartment. This version was popularly referred to as the “fat” or “pregnant” Sissy. 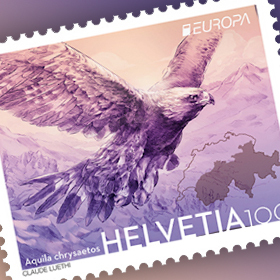 The company’s history dates back to 1823, when coach builder Heinrich Lohner founded his owncompany in Vienna. Under his son Jakob this became Jakob Lohner & Co, and under his son Ludwigthe company became the “k. k. Hofwagenfabrik”. It was Ludwig Lohner who, together with Ferdinand Porsche, built the world’s first hybrid automobile in 1899: the Lohner-Porsche. The company later manufactured aeroplanes, as well as tram cars and custom-built chassis. The company’s name waschanged to “Lohnerwerke GmbH”. The end of the Second World War ushered in the start of the moped and scooter production era: the L 98 scooter was followed in 1954 by the successful L 125 model and in 1957 by the Sissy. In 1970 the company was sold to the Canadian Bombardier group. However, in 2010 the Lohner company was founded anew by Andreas Lohner, a descendant of the family. Nowadays the company produces a two-seater e-bike and an electric scooter.